Kalypso Media is a global independent developer, marketer and publisher of interactive entertainment software. Headquartered in Germany, Kalypso Media was founded by industry veterans and media entrepreneurs Simon Hellwig and Stefan Marcinek. Kalypso is globally known as one of the leading publishers of strategy and simulation games for PC, Mac, Linux and consoles. Its titles, such as the bestselling ‘Tropico’ series, are available throughout the world via the company’s vast and expanded digital and traditional boxed distribution networks. 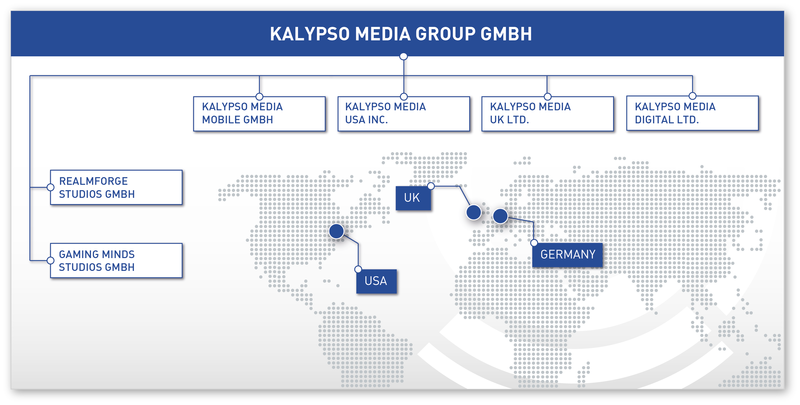 Today, Kalypso Media employs more than 120 motivated and talented employees at eight publishing and development facilities across Germany, the United States and the United Kingdom. As well as developing and marketing its own games, Kalypso Media also works with experienced, independent development studios throughout the world to deliver their products to the global audience both digitally and through boxed retail. Independent developers are given the opportunity to benefit from Kalypso’s vast knowledge in marketing and distribution by publishing high quality interactive entertainment software via Kasedo Games, Kalypso’s ‘Digital First’ division aimed at the mid-price range market. For more information and news about Kalypso Media and their products please visit our Facebook–Page and Twitter Feeds. Simon Hellwig, who studied International Business at the Royal Holloway University of London, amongst others, managed and owned Blackstar Interactive until 2003 with a turnover of over 3 million Euro, where he successfully implemented and developed the marketing concept of the "Episodic Computer Game Novels". The continuous up-keep of far-reaching business relationships in the entertainment industry, especially those with international distributors, led to the founding of the media rights trading company HEMETRA in 2003. After more than 10 years in the entertainment software industry, in the summer of 2006 Simon Hellwig founded Kalypso Media together with Stefan Marcinek, with headquarters in Worms, Germany. Today, he is responsible for all global sales and finance operations of the Kalypso Media Group, which expanded within seven years after incorporation into a globally operating game publishing group with offices and development studios in Germany, the UK and North America. Andrew Johnson been in the Games Industry since 1995, he started as Sales Manager at GT Interactive who published such games as Doom PS1, Hexen and Heretic PC. After 5 years he decided to move on and worked for BBC Worldwide as Head of International Sales, after 6 months he then took on the responsibility of the UK Sales operation as well. With the BBC he released titles such as Bob the Builder, Tweenies, Robot Wars and The Weakest Link. In 2005 joined Atari as Sales Director responsible for the UK, UAE and South Africa, the most recent title released was Alone in the Dark on X-Box360, Pc, Wii and PS2 in 2008. Since August 2008 he is serving Kalypso Media UK as Managing Director with the responsibility of running the UK office and servicing all European and Export territories outside of Germany/Austria/Switzerland. By February 2014 he took on the commercial and operations responsibility of Kalypso Media USA as well, reporting directly to the owners. After leaving the Armed Forces, Jonathan Hales started business in sales as Export Manager with SIP Industrial Products. After seven years of expanding new distribution channels throughout the world, Jonathan needed a new challenge and joined Codemasters as International Sales Manager where he quickly became Sales Director and then VP & General Manager. Having enjoyed another 7 years, with Codemasters, it was time for a fresh challenge. With the experience developed and the ability to develop both project and commercial strategies. Jonathan joined Kalypso Media and set up Kalypso Media UK Ltd, managing all aspects of the international sales. Due to positive personal changes, he left Kalypso and became Managing Director at Southpeak Interactive. However, after three years, Jonathan couldn't keep away and rejoined the Kalypso group, this time as the Managing Director of Kalypso Media Digital Ltd, where he currently manages and directs all things digital! Mark Allen has been part of the videogames industry for over 18 years and has worked on some of the industry’s biggest and most successful brands. After starting his career at Cryo Interactive he spent time at Take Two and Koch Media before joining Eidos Interactive in 2002. After leaving Eidos, he joined Activision and later went on to 505 Games in 2007. During his career, he managed the PR campaigns for many successful games brands such as Tomb Raider, Championship Manager, Hitman, Call of Duty or Tony Hawk. Mark joined Kalypso Media UK in 2009 as Head of Marketing and PR and works with the team to plan and activate PR, marketing and sales campaigns across UK media and retail as well as supporting Kalypso’s vast network of distribution partners across all territories. Marcus Behrens started his career in the games industry as a Product Manager with Warner Interactive. In 1999 he joined Eidos Interactive where he was responsible for the conception and development of marketing strategies and campaigns for their AAA GSA game releases. Later, he held leading positions in Marketing, Product Management and Business Development. From 2010 to 2014 Mr Behrens was member of the Bigpoint HQ Senior Management Team. This position saw him successfully set up and form the Product Management team as well as the then newly founded 3rd Party Publishing division. Since January 2015 Mr Behrens heads the Publishing business of Kalypso Media Mobile as Publishing Director.